aint-Emilion and Pomerol are the two great names associated with the Right Bank but there are an increasing number of well-priced, exciting wines emerging from the other ACs. It is also interesting to note that these are all red wine appellations. Saint-Emilion itself is the driving force in terms of volume and accounts for some 40 per cent of all wines produced here. As a result it’s not surprising that there is a wide variation in quality and very diverse terroirs, some exceptional and some, particularly in the southern plains of the AC, distinctly ordinary, with heavy productive soils. Many of Bordeaux’s major developments in vinification techniques and the influence of consultant winemakers have their origins in Saint-Emilion. Pre-fermentation cold soaking (or maceration), malolactic fermentation in barrel and micro-oxygenation are now practiced all over the world. 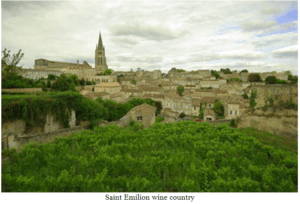 Saint-Emilion’s Classification has been revised a number of times in recent years. There are 18 Premiers Grands Crus Classés with four A-rated properties, Ausone and Cheval-Blanc, joined by Angélus and Pavie in 2012 and 14 B-rated, including newly promoted (in 2012) La Mondotte, Canon La Gaffeliére, Valandraud, Pavie Macquin and Larcisse-Ducasse, as well as 64 properties rated Grand Cru Classé. There have been major investments in recent years in both vineyards and cellars, resulting in some highly priced wines made in very limited quantities. The most notable of these has been La Mondotte, produced at Canon-La-Gaffeliére. Many other tiny-production wines or vins des garagistes have also emerged. Some have been very impressive, but others are over-extracted and they have generally been pretty expensive. Pomerol, in contrast, continues to provide some impressive and startlingly opulent wines, full of dark and spicy fruit, generally supple and more approachable than many of the other top wines in Bordeaux. Inevitably there are exceptions to the rule and these tend to occur where there is a higher proportion of Cabernet Franc or Cabernet Sauvignon planted or the soil has more gravel. Pomerol’s clay soils suit Merlot very well and provide this uniquely exotic style. Pomerol’s wines can also be some of the priciest anywhere on the globe. There has been investment and development here but not on the scale of Saint-Emilion’s. The lower tier of the appellation, though, can disappoint. The odd wine of distinction is also beginning to emerge from the lesser Saint-Emilion satellite ACs, Lussac-Saint-Emilion, Montagne-Saint-Emilion, Puisseguin-Saint-Emilion and Saint-Georges-Saint- Emilion, as well as Lalande-de-Pomerol. To the north-west of Libourne are the areas of Côtes de Bourg and Côtes de Blaye. The former produces reds, some decent and some very impressive while dry whites are produced in the latter. To the immediate west of Libourne are Fronsac and Canon-Fronsac. Good, stylish, well-made darkfruited styles have been produced here for a decade or so. To the east of Saint-Emilion are the Côtes de Castillon and Bordeaux-Côtes de Francs. Again these are areas of great potential and the best wines are still well-priced, if becoming less so. Between the Dordogne and Garonne rivers is a substantial vineyard area comprising some nine appellations. Geographically and physically by far the most important is the Entre-Deux-Mers, an appellation devoted to dry whites. A number of properties here are also producing good AC Bordeaux red. The appellation is all about maximising modern white winemaking with some good results, using pre-fermentation skin contact, ageing on lees and, in the more expensive wines, limited barrel-fermentation and ageing with new wood as well. Some well-priced wines have been availablefor some time now. Vibrant red and rosé is made in the Premières Côtes de Bordeaux, just to the east across the Garonne from the city of Bordeaux, and there are good sweet wines on the eastern bank of the river at Cadillac, Loupiac and Sainte-Croix-du-Mont. In the far east is Saint-Foy-de- Bordeaux, where there are reds as well as dry and sweet whites.